Do you get discouraged when you think about how long a project will take to make? We all have those thoughts every now and then but when we think about how long these items will last it will far outweigh the time it takes to make. So take pride in the amount of work you put into each project and you’ll find joy in each step. It might not be as much as you think! 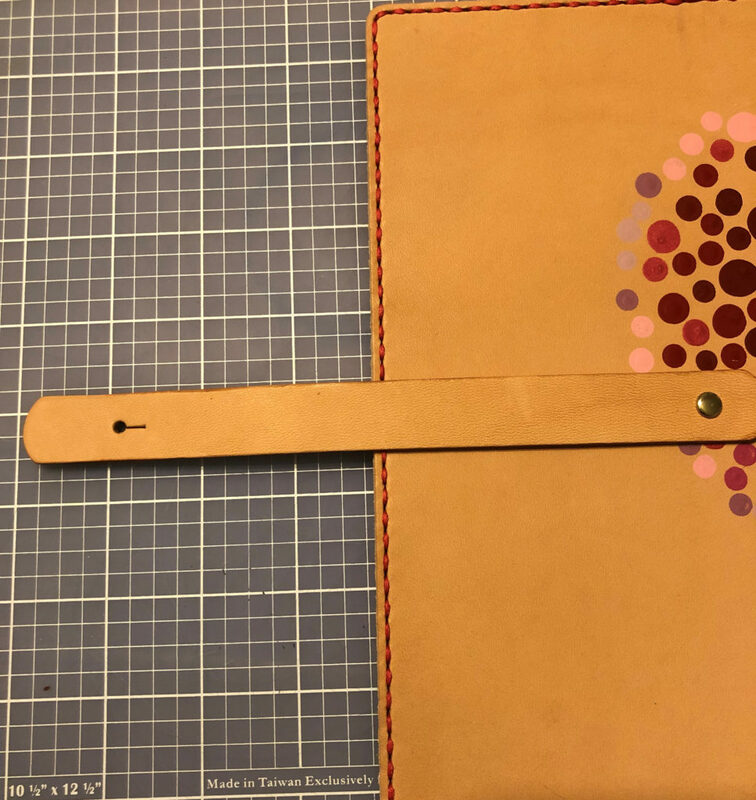 Starting a leathergoods business can seem like a big undertaking, but like anything, you can make starting a business as complex as you want it to be. You can also start a leathergoods business that is simple, streamlined and designed to fit your time restrictions, budget, and overall needs. This is especially true with an online leathergoods business. In this article, I’m going to break down the top 5 start-up costs that you’ll need to consider before diving in. I’ll also give you a breakdown of the common monthly recurring costs of starting an online business so you can have an idea of how much the business is going to cost to run. And just a heads up, what I won’t be including in the breakdown is the cost of your toolkit because you’re probably not thinking about starting a business if you haven’t already honed your skills as a leatherworker first. And if you’ve honed your skills, you probably already have your toolkit. One thing that I do want to caution you about is when you’re starting a new business, keep your overhead costs as low as possible until you’re making sales and profits. Whenever deciding to make any purchase, big or small, ask yourself one question. If your answer is no, not really, then don’t buy it. Wait until your business is starting to make money before you decide to upgrade things in your business. I’ve broken the costs related to starting a business into 3 separate categories: One-Time Start-Up Costs, Recurring Monthly Costs, and Your Initial Investment. I’ve also added suggestions for how to keep your initial costs and overhead low. Now chances are since it’s 2019, you already have a computer and a printer and the basics of a home office. Which is great because then you don’t need to spend any money here. But in order to start an e-commerce business, obviously, you’re going to need to have a way to get online to create a website and list and promote your products to your customers. It might be tempting to run out and buy a new computer, but if you can use your current one, even if it’s an older model, then I highly recommend you do so. And if you do not have a computer or printer, no need to worry. Can you borrow a friend’s computer or use a computer at the library instead of purchasing a computer just yet? Doing so will ultimately help to keep your overhead costs way down. Quality product photos are key when it comes to selling handmade products online. We all know that at this point, right? If your customer can’t see a good representation of what you have to offer, then chances are, they’re not going to buy it. Most of the time this requires a good quality camera and studio lighting, however, a quality camera and studio lighting is not a cheap purchase! So if you have a decent camera currently, use it and take your pictures on a white background and in natural light. Alternatively, ask a friend or family member who has a camera or lighting equipment if you could borrow it for a weekend to get some good shots of your products. Or maybe you have a photographer friend that would take your photos for you in exchange for one of your leathergoods. Think outside of the box here so that you can keep your overhead costs low until your business is more established. A makers mark is a great one-time investment because like an artist’s signature on a painting, this is your way to “sign” your leathergoods with your brand and logo. A makers mark is usually made by using a heated branding iron or embossing the image of your logo on your leathergood. There is a wide array of options when it comes to the device that you use to make your mark. You can go the soldering iron route which starts around $25 all the way up to higher quality machines upwards of $800 to create the mark. And the cost to create a logo stamp is fairly inexpensive and can be made for about $40. Well, yes you are, but you will be using your profits (make sure you’re pricing your products for profits) on the sales of your leathergoods to reinvest back into your business so that you can purchase more materials and supplies. To come up with your initial budget for raw materials, take a look at the products that you’re going to be offering and crunch the numbers. Since you are a brand new business, you don’t have a sales data to tell you what your best sellers are, and how well your products have sold in the past, so I would keep your quantities on the low side. The last thing that you want to do is produce a line of leathergoods that doesn’t sell and then be stuck with a large investment in inventory that is just sitting on a shelf. I suggest making a sample run of your products to start. Make one of each product so you can take great product photos for your site and then list them as made to order for the first few sales. 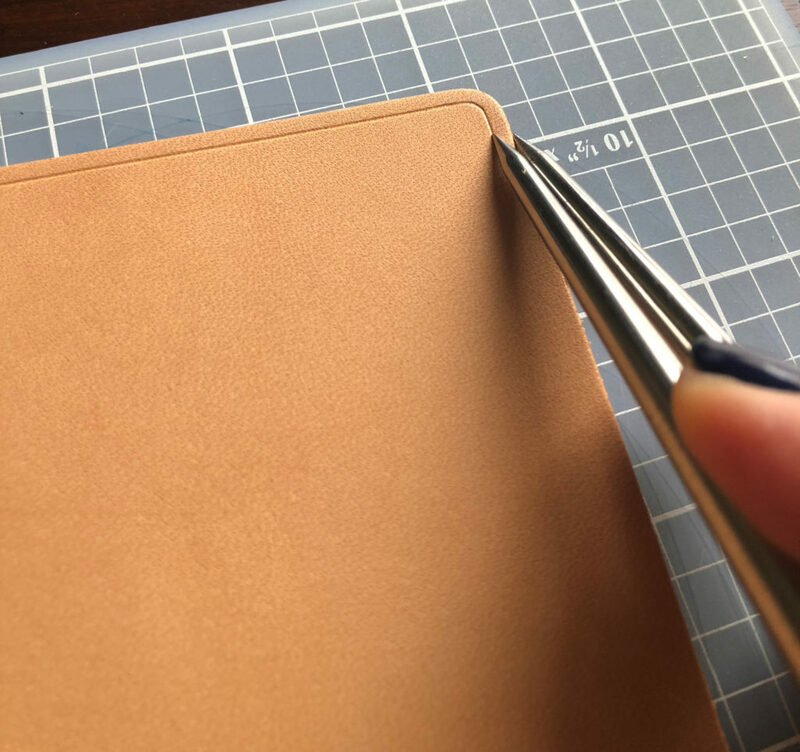 Once you see that you have some repeat orders for a certain product, you can start to build up an inventory of that leathergoods item. So for now, determine how much of all the materials you will need to create your sample run. Business cards are a very low investment that have a great ROI! When you first start your leathergoods business, you want to be telling everyone all about what you do and where they can see your work. You also want to be making it easy for people to contact you at least by email, if not also by phone. So you’ll need a card. You’ll give your business cards to people you meet, with every order, at craft fairs and networking events. Allow around $20-50 for your first basic business card run. 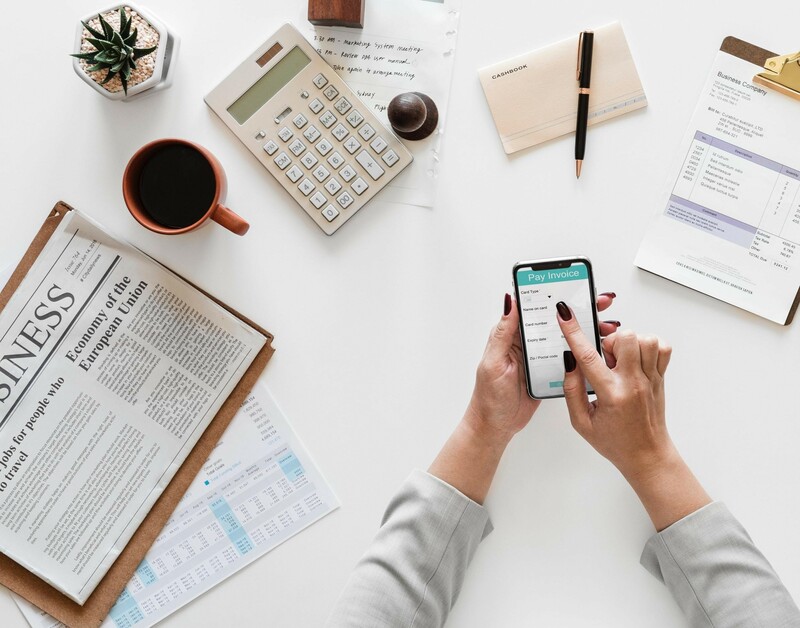 Your recurring monthly costs are going to be the costs that you can expect to pay on a monthly basis, so make sure you have these in your initial budget as well. You will need anywhere from $10+ depending on your domain or URL that you’ll choose for your website. I paid about $30 to get my domain, www.leatherbeast.com. You can expect to have to renew your domain annually. These are the fees that you’re charged to host a website. So whether you use Shopify (about $29/month) Squarespace (about $30/mo) or some other platform for your website, you should expect to pay a monthly fee. If you decide that Esty is going to be the platform that you choose to set your shop up on, the good news is that you won’t have a hosting fee, but you will have listing fees. Etsy charges for you $0.20 for each product that you list. An email service provider is an email platform that helps you with your email marketing. They help you to collect new email addresses from people who want to be on your list AND they help you to manage those subscribers so that you can be sure you’re sending certain emails out to everyone on your list or only certain groups that you want to receive them. Costs can be free up to $30+/mo. Google apps is one of my favorite software apps that I use in my business. It allows you to create a professional email using your website url, like info@leatherbeast.com which is much more professional than leathereast@gmail.com. The google apps suite also comes with Google docs and Google spreadsheets that you can share and update from any device. My business literally would not survive without these handy tools! The cost is minimal at about $5/mo. This one is optional, but it is good to think about at the start. Many new businesses allow for a huge advertising budget out of the gate, but it is not always necessary, especially when you have good organic traffic to your website. But just know that social media ads, if done properly, can really boost your web traffic and sales for your business. Your initial investment really depends on your personal financial situation. Your initial investment is the backup funds that you’ll have in case your business is not a hit right of the gate, which to be honest, it probably won’t be. But that’s totally normal. Every new business needs to have time to grow. To stay afloat and manage your startup and recurring costs, you need to have an initial investment into the business. So, how do you know how much your initial investment should be? If you currently have a job or have a spouse or family member that has agreed to help support this new endeavor of yours, that is fantastic. Because if all of your personal expenses (rent, mortgage, car payment, utilities, etc.) are going to be covered by your current income or the support of your lovely family, then you’ll just need to include your startup costs and monthly business costs in your initial investment. If you’re starting this business full time without any other source of income or support, then you’re going to need to have a larger initial investment. This investment will not only need to include your startup costs and monthly business costs but also your personal monthly expenses. If you don’t already know what your monthly personal expenses are (this includes everything that you need to survive) then I suggest you take a minute here and add up all of those costs. I suggest having at least 6 months’ worth of your combined monthly expenses saved, but you might even want to have more saved. When I quit my job, I had an entire year’s worth of expenses (business and personal) saved because I didn’t want to run into any emergencies that I couldn’t handle. So now it’s your turn. 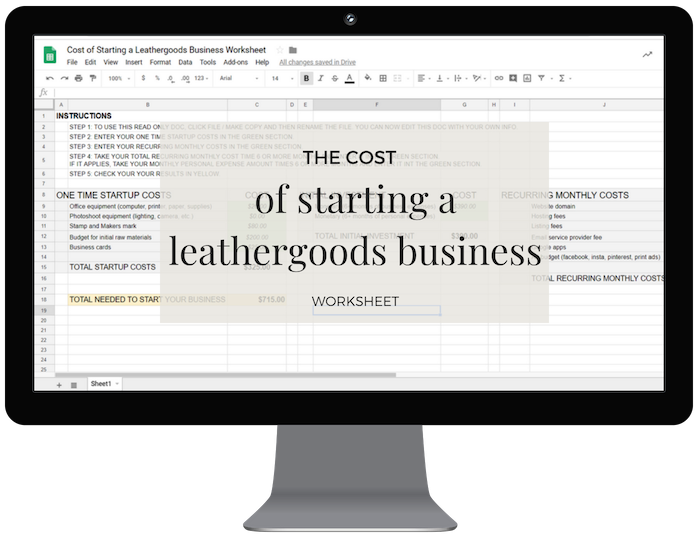 What’s it going to cost to start YOUR leathergoods business? Click here to use the free spreadsheet to track your costs. To learn more about what it takes to build and grow a profitable leathergoods business, download your free copy of THE LEATHERGOODS BUSINESS BLUEPRINT at www.lucrativeleathercraft.com. In this week’s The Leather Element, we had a viewer email us saying she was having trouble setting segma snaps. These snaps can be tricky, watch as Chuck goes through the process from start to finish using our Deluxe snap and rivet hand setter and hopefully clears up any trouble you may be having. 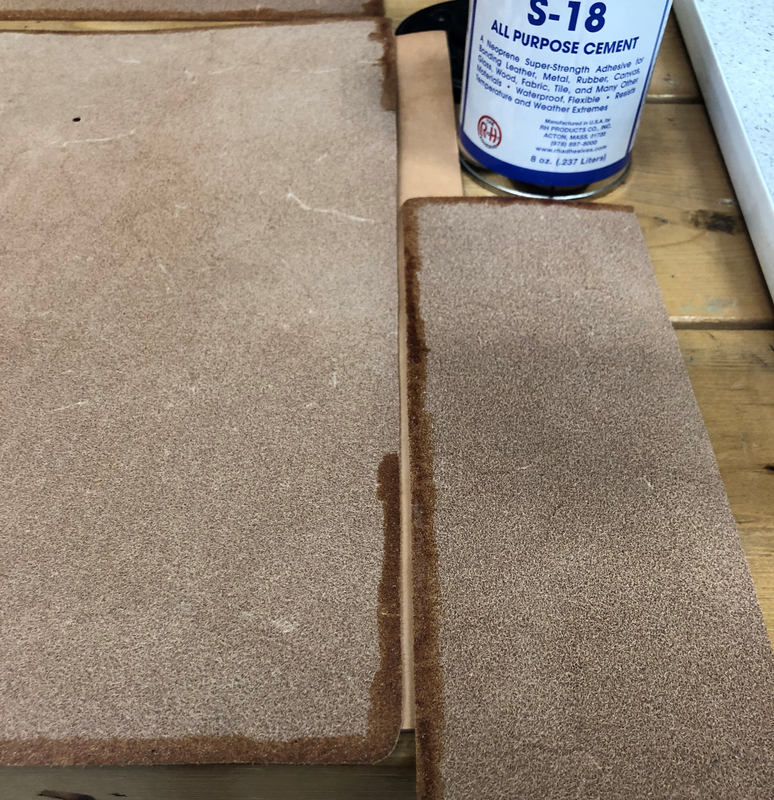 In this week’s The Leather Element, Chuck discusses getting your veg tanned leather engraved and also shows some examples of items he has gotten engraved. 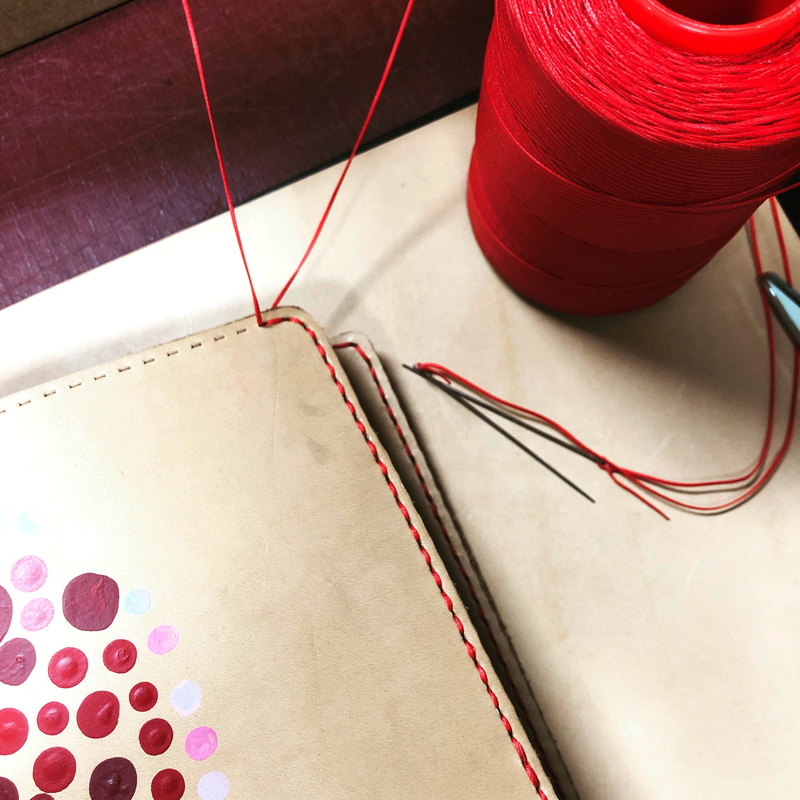 I had so much fun taking one of the Weaver Leathercraft Journal Cover Kits and adding some fun details to make it the perfect gift for Valentine’s Day! 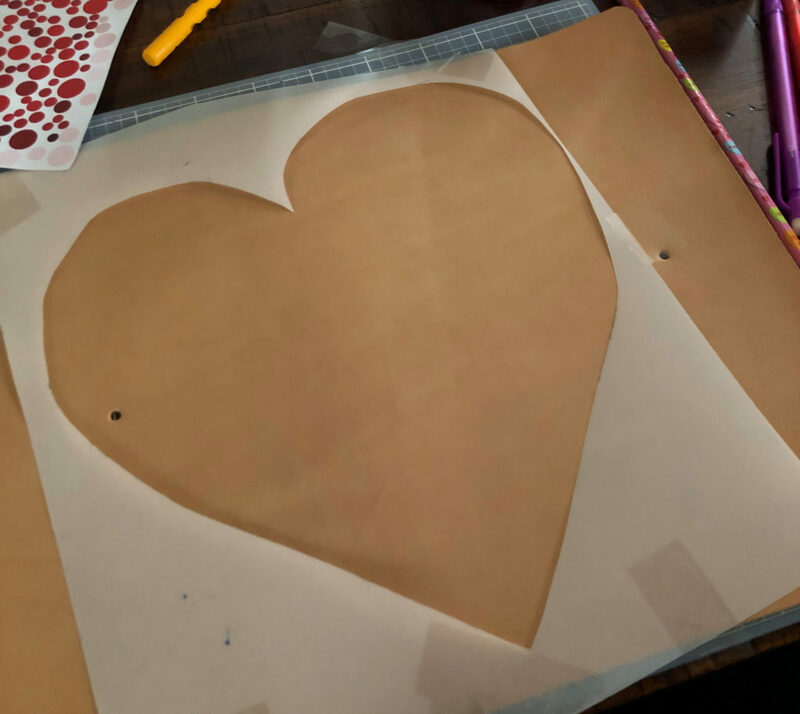 To make the heart, I took some tracing film and cut it roughly the size of the face of the journal. (I cut mine too small the first time and ended up having to tape it to my leather, which isn’t ideal.) 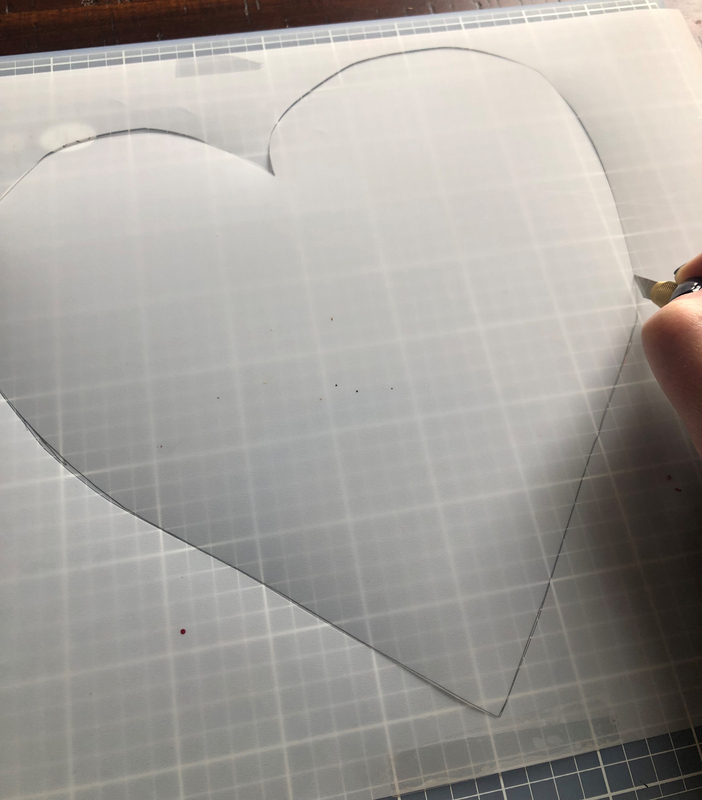 Draw a heart shape, making sure it is at least half an inch in from the edge. The heart does not have to be perfect, rustic works well for this. I also tilted mine so the point of the heart is on the front of the journal when closed. Take your art knife and cut out the heart. You’ll use the outline as a guide for the painting. 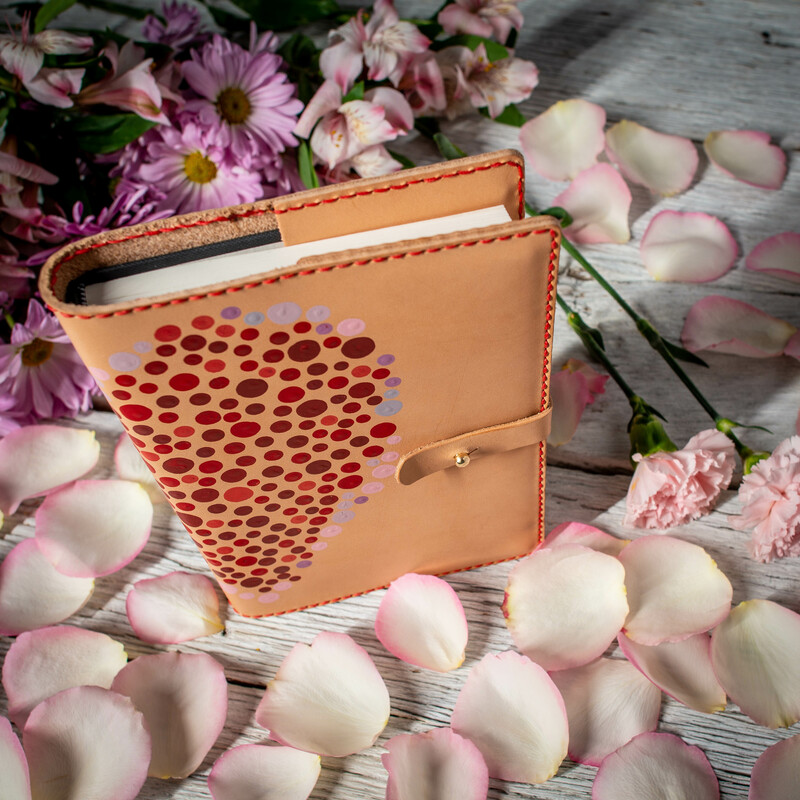 Tape the tracing film with the cut-out heart onto your journal, positioning it where you want the heart to be. You can see I didn’t make my tracing film large enough the first time so I had to tape it to my leather. Time to paint! This is where you can get as creative as you want. There really is no way to mess this up. Take the Angelus paints of your choice; I used quite a few colors: Pink, Red, Autumn Red, Magenta, & Light Grey in the Acrylic Paint and Riot Red in the Pearlescent Paint. 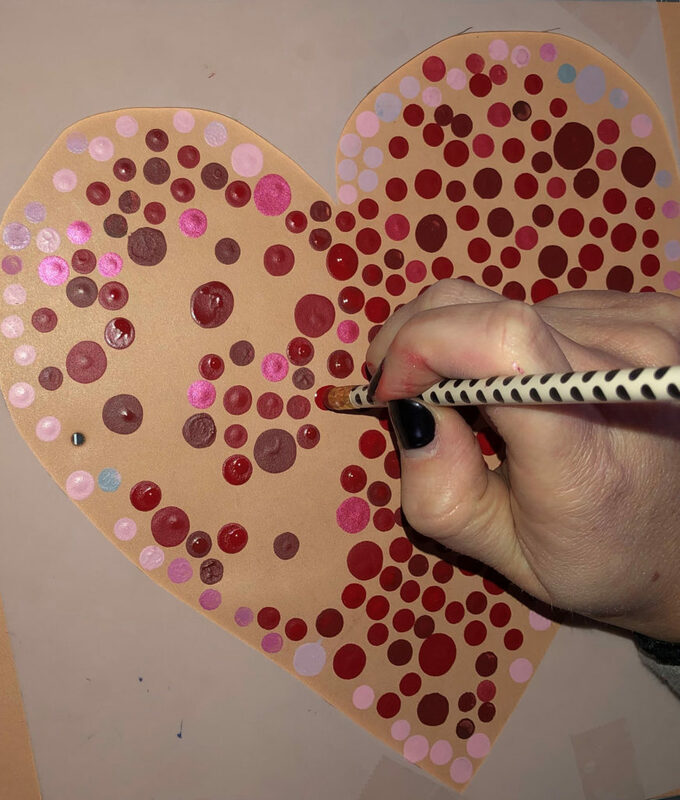 Using the tip of the pencil eraser, dip it into the paint and start making paint dots or circles in random order. 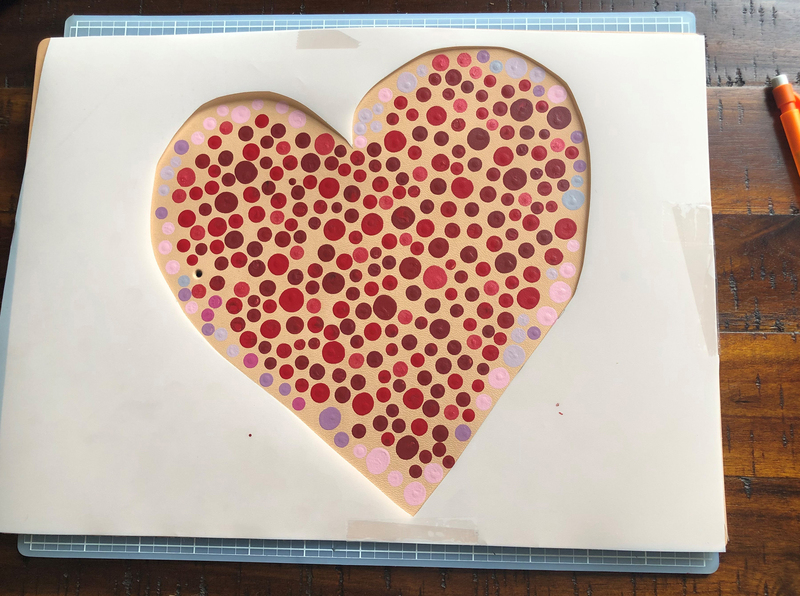 I put some lighter pinks, grays and magenta dots around the edge of the heart first and then filled it in with the Riot Red, Red, and Autumn Red. You can mix the paints as you want to get some lighter reds and darker reds. For larger circles, swirl the eraser in a circular motion. After the paint is dry, remove the pattern from your journal and add the top coat of your choice. 4. 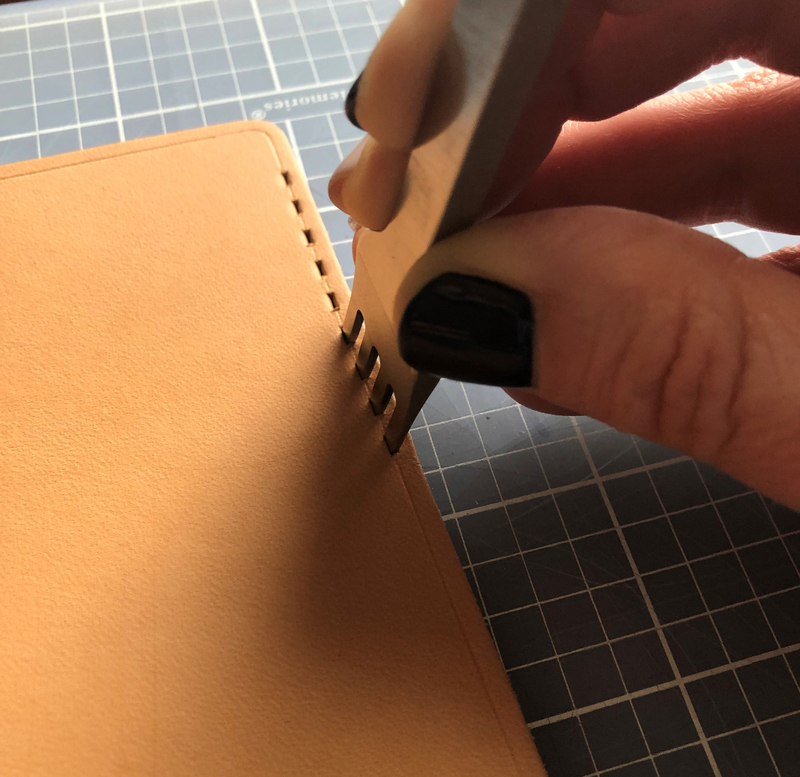 Stitch your journal together using a saddle stitch. Instead of using the white thread that came with the kit, I used red to bring out the paint colors and bring the whole look together. 5. Finish your edges using an edge beveler and slick with Gum Tragacanth or water and an edge slicker. Insert the journal and your journal cover is complete! You can customize these covers any way you want with paint, tooling & stamping, and dying.